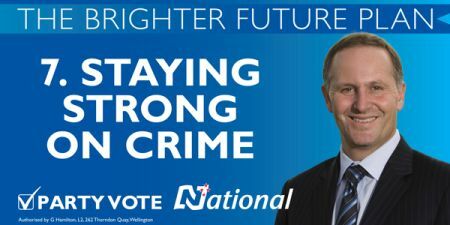 It should not be lost on most politically conscious folk that one of National’s strongest, most agressively promoted tenet is that of “Law and Order”. 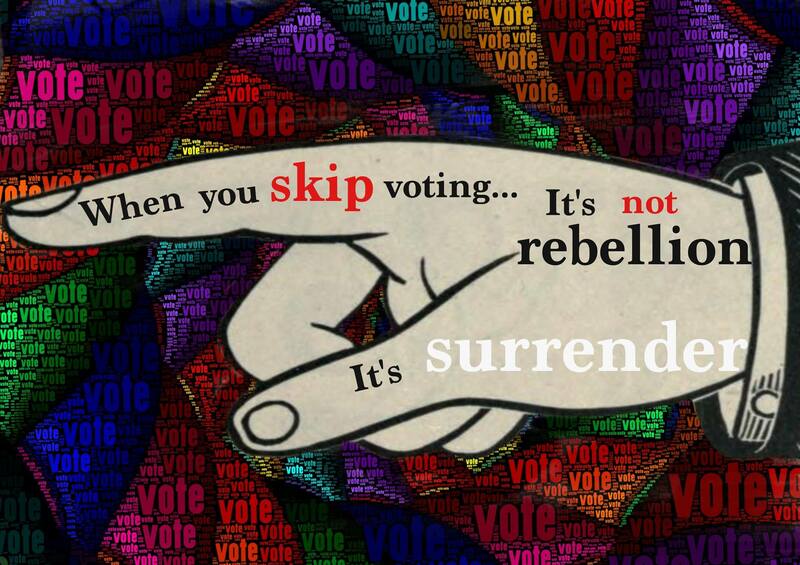 One of it’s seven main election billboards, for the 2011 election, was the image at the top of the page. 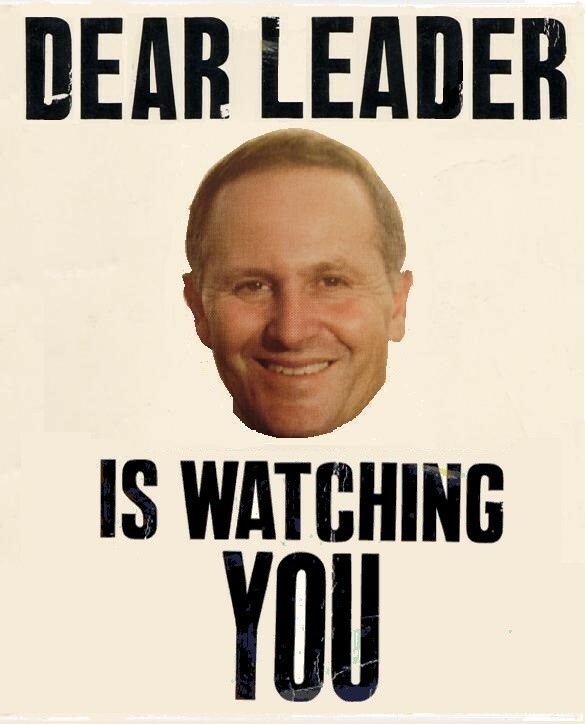 The GCSB’s mandate was changed two years ago to permit it to spy on New Zealanders. 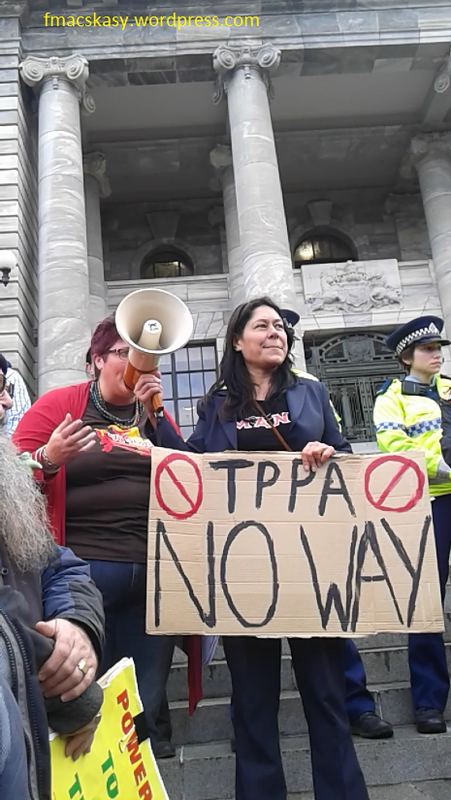 This, despite protests from New Zealanders up and down the country, opposed to extending the powers of the State into our lives. 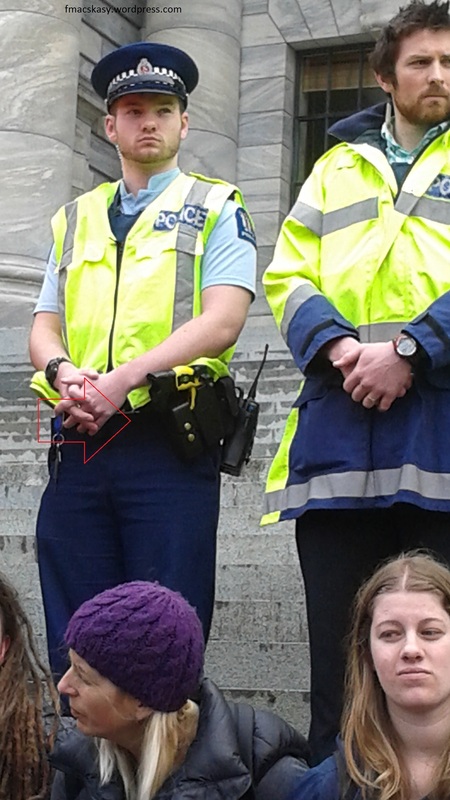 One wonders if Michelle Boag attended any of the anti-GCSB protests that’s been held around the country? 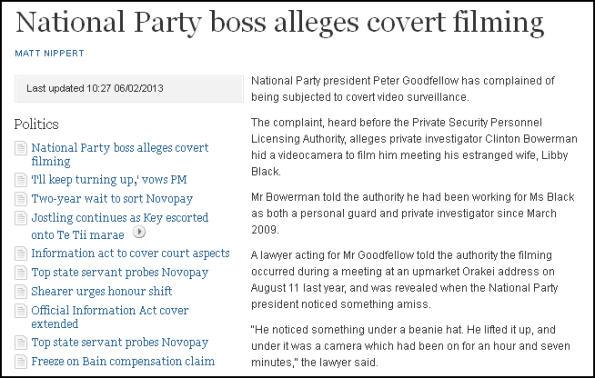 I blogged on the issue here: National Party president complains of covert filming. 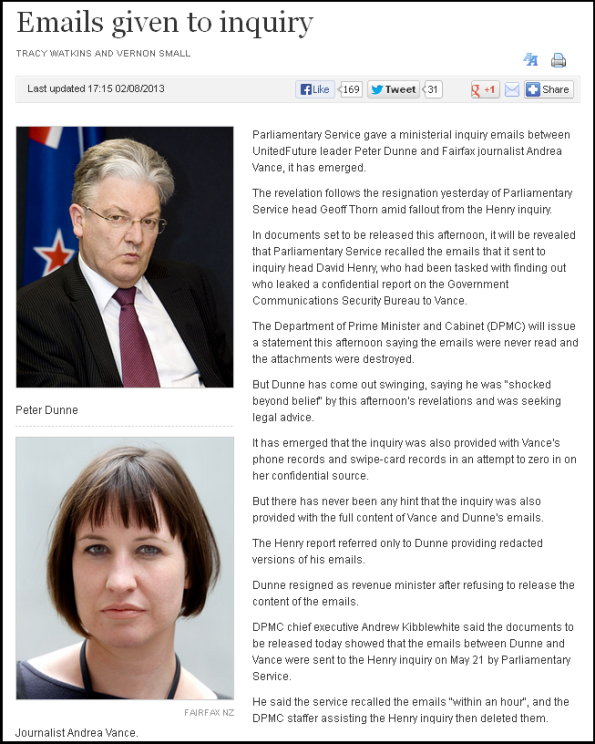 Then-Fairfax journalist, Andrea Vance, also had her Parliamentary phone and swipe-card records passed on to the PM’s Department (which was “assisting” the Thorn Inquiry), as an investigation was held into the identity of the secret source who leaked Vance a confidential report into the GCSB. 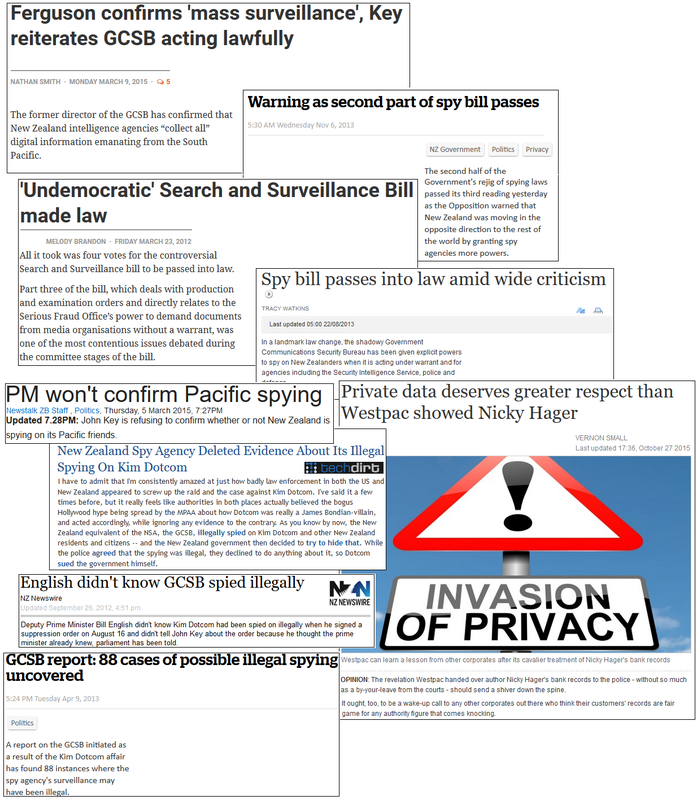 The irony is that even as Peter Dunne was rearing up and braying in self-righteous indignation at the invasion of his privacy, two and a half weeks later, he voted with National in the Third and final reading of the Government Communications Security Bureau Amendment Bill (now an Act) which passed it into law. Now everyone in New Zealand could have their privacy invaded. When governments pass laws extending the powers of the State’s security organisations, and increase surveillance capabilities of spy agencies, then it has created a fertile environment where privacy is no longer as sacrosanct as it once was. 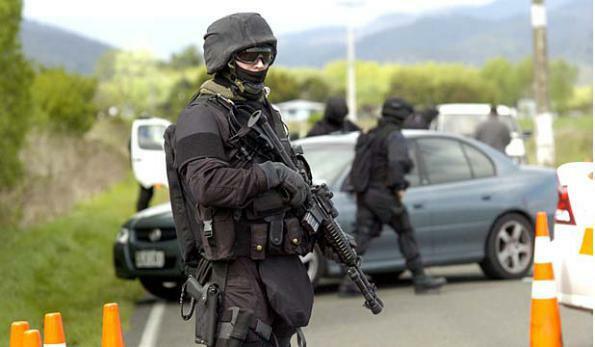 Whether it be police stopping motorists at random to detect potential drunk drivers*; a private investigator recording a conversation; or one government agency passing private emails on to another; or covert surveillance on potentially all New Zealanders, a new norm has been created. Michelle Boag may be indignant at being stopped on her way to her golf on a Saturday morning – but her right to unimpeded travel on our roads was extinguished a long time ago. The State now has the right to stop her as, when, and however, it’s security agencies ‘deem necessary’. She may even have her phone and internet tapped, should she ever run foul of a future government. 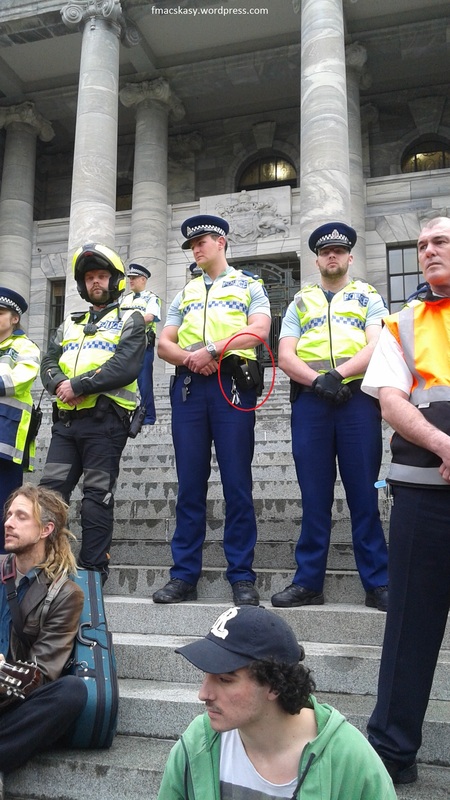 I love it when National’s quasi-fascistic law and order policies eventually catch up with it’s own supporters. 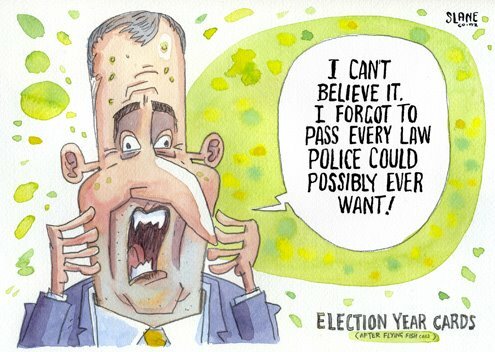 It should be noted that this blogger has no problem with random breath-testing conducted by Police. 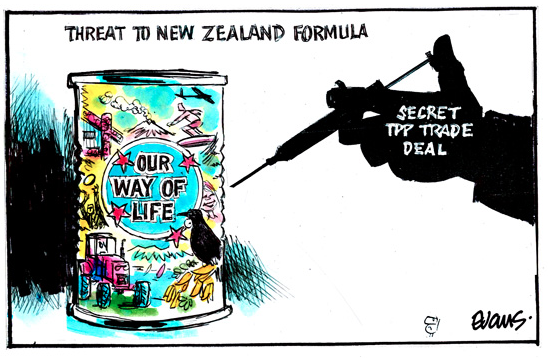 Whilst this country is awash with cheap, easily-available booze; and whilst New Zealanders refuse to address our penchant for binge-drinking, random breath testing is one of the few means we have to protect ourselves and our families from liquored-up drivers. 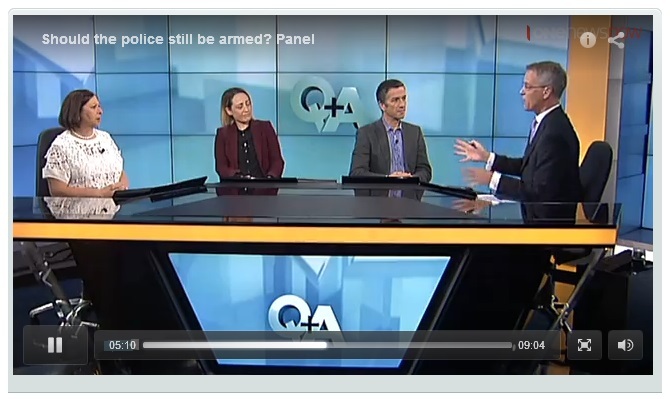 Michelle Boag needs to get over her preciousness and sense of entitlement in this regard. The next drink driver the police catch could be one on her road, as she drives to her golfing rendezvous. 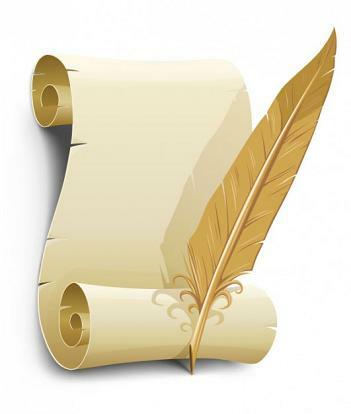 This blogpost was first published on The Daily Blog on 28 Octobr 2015. 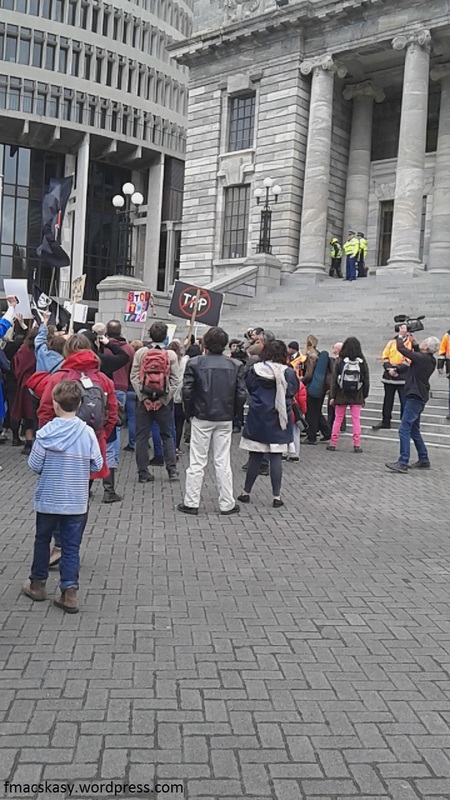 NZ, Wellington, 15 August – Anti-TPPA protesters, many of them young people in their teens and early 20s, faced off against police armed with tasers on the steps of Parliament. At least five weapons were clearly visible, with other policemen and woman wearing bulky jackets that may or may not have concealed more of the devices. 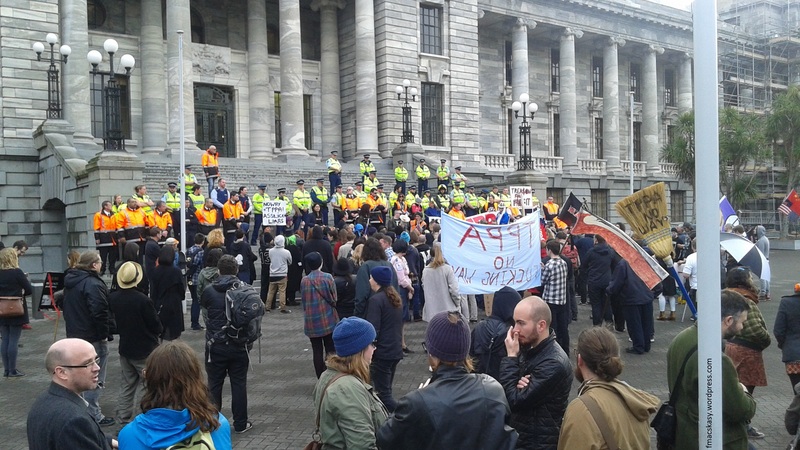 Though there was some minor jostling between one protester and a Parliamentary security guard, there was no violence or any other physical contact between police and members of the public. The confrontation began when a lone protester made her way to the top of the Parliamentary steps, and seated herself, adopting a meditating position. For a short time, three police attempted to persuade her to move, though no force was used. She was followed by others, who also jumped or skirted around the security fence separating the grassy area from the paved Parliamentary forecourt. 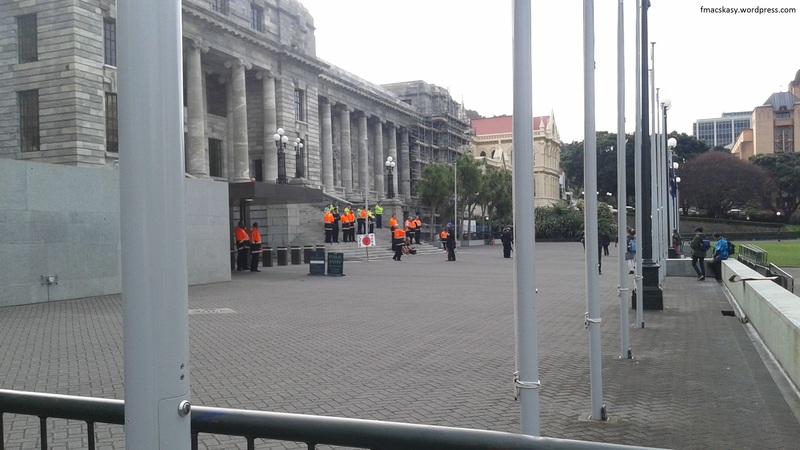 As their numbers swelled to approximately a hundred, extra police arrived quickly and with Parliamentary Security, formed a cordon across the steps leading up to Parliament. March organisors and Marshalls attempted to quell the situation by asking people to move back from the steps, without much success. 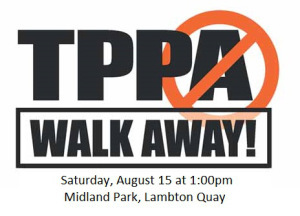 Eventually, jostling and shouting gave way to a calmer atmosphere as March organisors encouraged a constant stream of speakers to address the crowd. The tiny volatile minority, numbering perhaps half a dozen, joined others seated on the steps. 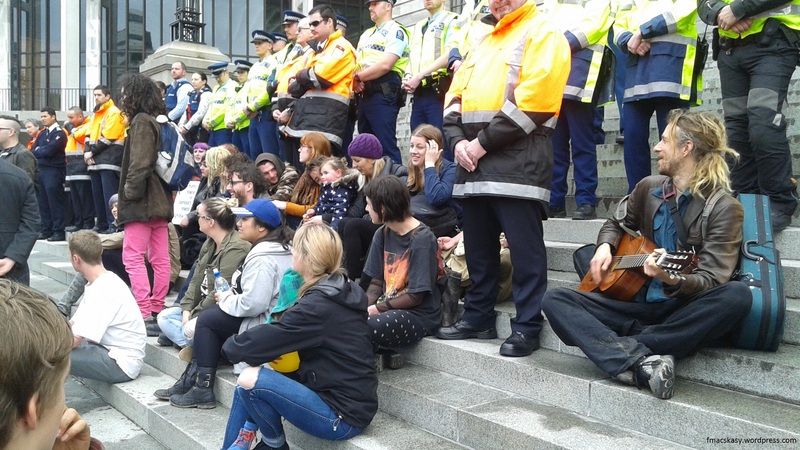 One activist played his guitar and sang songs, though at one point he declined a request for “anything by Dave Dobbin“. 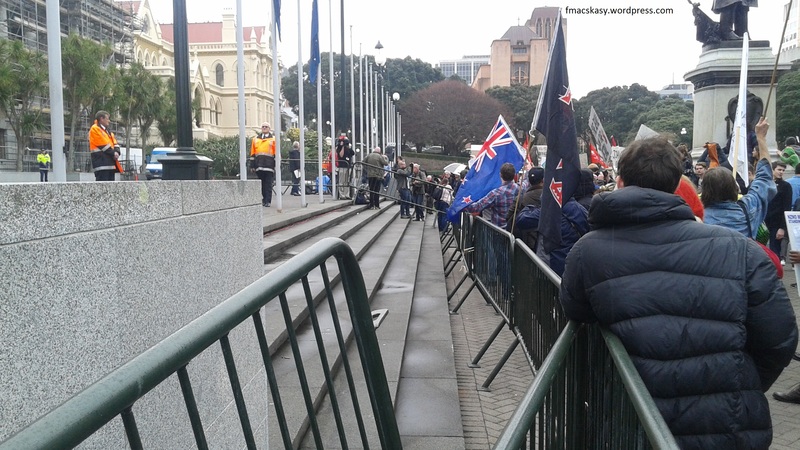 After about a hour, the crowd on the Parliamentary forecourt dispersed of their own volition. Police numbers also reduced, with officers leaving the scene. 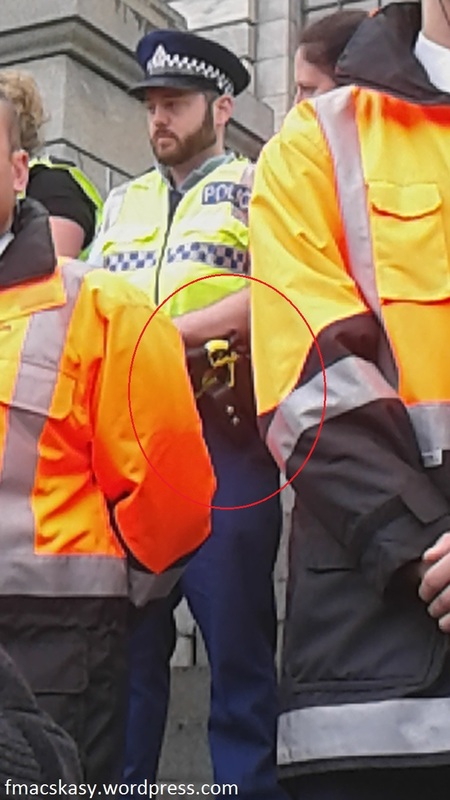 There was no apparent reason for tasers to be deployed on this occasion. The sight of these weapons incited many in the crowd to angry outbursts toward the police. 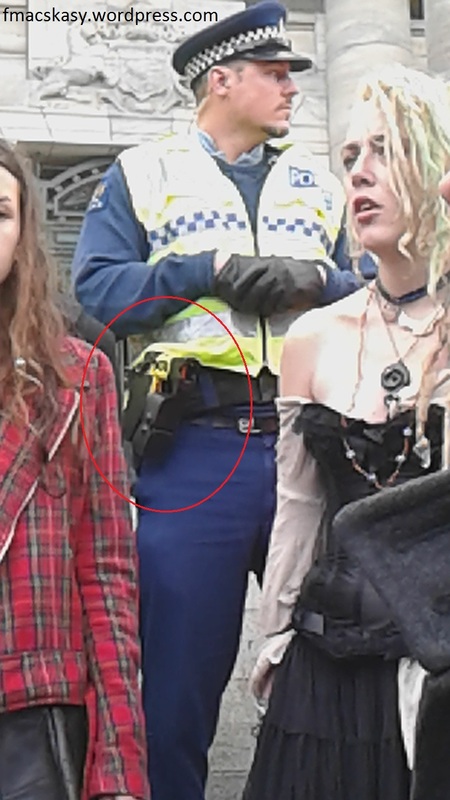 More than one person was overheard asking what possible use four or five tasers would have been against a crowd numbering in the hundreds. On this occasion, a tense situation was prevented from escalation not by show of force, but by the wit of organisors who distracted the ‘hot heads’ and encouraged dialogue and engagement. The best strategy in this stand-off was patience. 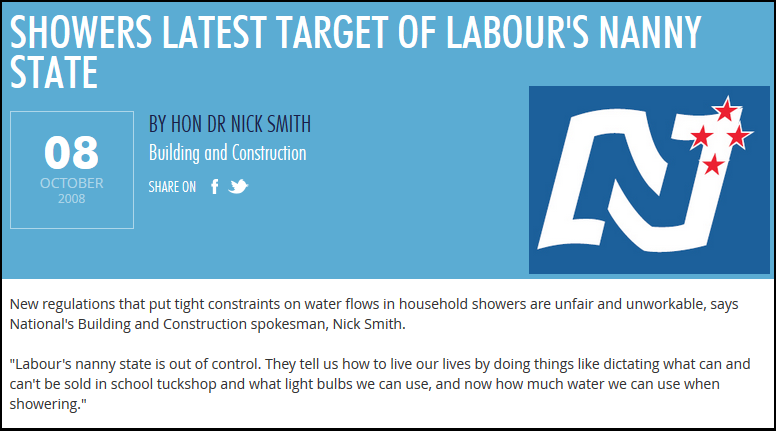 This blogpost was first published on The Daily Blog on 16 August 2015. A cash-strapped government – having frittered billions away in two tax cuts for the rich – now seeks to penny-pinch voluntary organisations and charities to make up for the gaping deficits they have created?! This government is planning to implement a user-pays charge whereby charities; other voluntary organisations, and non-profit groups are required to pay for police vetting of volunteers and employed staff. How long will it be before the $5 or $7 vetting fee becomes $10? $20? Then full recovery costs? If there is one thing we know about government charges, once they are introduced, they invariably increase as governments look to cut taxes, and raise user-pays charges for state services. Tertiary fees, fuel taxes, gst, prescription fees, court costs, are all examples of government shifting costs on to the individuals and public organisations. One day, New Zealanders will wake up to the realisation that far from being “prudent fiscal managers”, National’s track record in managing the government books are ad hoc and worse still, penalise those who need help the most. This is penny-pinching in the extreme, and shows how we are still paying for two ill-considered and unaffordable tax-cuts in 2009 and 2010.